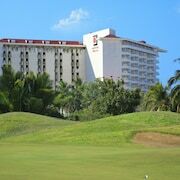 Situated in Ixtapa, this luxury hotel is within 2 mi (3 km) of Quieta Beach, Linda Beach, and Ixtapa Island. El Palmar Beach is 2.4 mi (3.9 km) away. Excelent service and beautiful setting, the place is a dream. Where to find Ixtapa - Zihuatanejo hotels near an airport? How can I find hotels in different Ixtapa - Zihuatanejo neighborhoods? Where can I find hotels in Ixtapa - Zihuatanejo that are near tourist attractions? 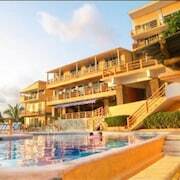 Apartment and hotel choices are in abundance in Ixtapa - Zihuatanejo. Within Expedia's up-to-the-minute accommodation pages you can find 62 long- and short-stay options within a 0.1-kilometre (0.1-mile) radius of Ixtapa - Zihuatanejo's center. Those hoping to sleep in a nice central location in Ixtapa - Zihuatanejo should check out the latest deals at the La Casa Que Canta - Adults only and Hotel Aura del Mar. 5 kilometres (3 miles) from the middle of Ixtapa - Zihuatanejo is the hotel neighborhood of Ixtapa. It boasts 23 establishments. Accommodation options include the Capella Ixtapa Resort & Spa and Azul Ixtapa All Inclusive Beach Resort and Convention Center. Also popular with travelers is Centro, which is an alternative Ixtapa - Zihuatanejo hotel neighborhood that is 0.3 kilometres (0.2 miles) from the middle of Ixtapa - Zihuatanejo. Centro's better known accommodation options are the Hotel Victoria Zihuatanejo and Zihuatanejo Centro. The Embarc Zihuatanejo and the Viceroy Zihuatanejo are an easy walk from La Ropa Beach. The Embarc Zihuatanejo is 0.4 kilometres (0.2 miles) away from La Ropa Beach. The Viceroy Zihuatanejo is 0.2 kilometres (0.1 miles) away. The Hotel Villa Mexicana and Casa Cuitlateca are nearest to Las Gatas Beach, and the Catalina Beach Resort and Hotel Irma are within an easy stroll of Fisherman's Walk. Those traveling to Ixtapa - Zihuatanejo for Principal Beach could look at staying at your choice of the Casa Sun and Moon and Hotel Villas Miramar. 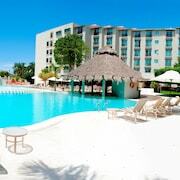 And, if you are interested in staying near Contramar Beach, your most convenient accommodation options include the Hotel Zihua Caracol and Hotel Villas El Morro. 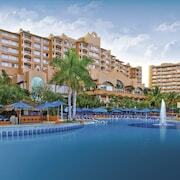 The Azul Ixtapa Grand All Inclusive Suites & Spa is 10 kilometres (6 miles) from the main part of Ixtapa - Zihuatanejo. 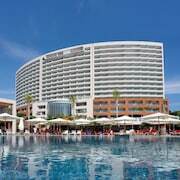 Another accommodation option is the Sunscape Dorado Pacifico Ixtapa Resort & Spa All Inclusive, which is located 6 kilometres (4 miles) away. 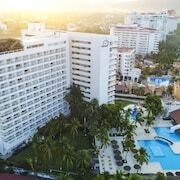 Two more places to stay around Ixtapa - Zihuatanejo include the Barceló Ixtapa All Inclusive and the Park Royal Ixtapa All Inclusive. Zihuatanejo is 0.4 kilometres (0.2 miles) to the west of Ixtapa - Zihuatanejo, and is where you'll find the King's Reef and Larga Beach. Some of our recommended Zihuatanejo hotel options include the Las Brisas Ixtapa and Pacífica Resort Ixtapa. Or, stay in Troncones, 25 kilometres (16 miles) to the northwest of Ixtapa - Zihuatanejo, where you can choose from the Present Moment Retreat and Roberto's Bistro. If you stay in Troncones, be sure to explore Manzanillo Bay and Troncones Point. Located 10 kilometres (6 miles) from Ixtapa - Zihuatanejo is Ixtapa - Zihuatanejo International Airport. Stay nearby at Casa Kau-Kan or Las Palmas Beachfront Villas. What are the most popular Ixtapa - Zihuatanejo hotels? Are there hotels in other cities near Ixtapa - Zihuatanejo? What other types of accommodations are available in Ixtapa - Zihuatanejo? Explore Ixtapa - Zihuatanejo with Expedia.ca’s Travel Guides to find the best flights, cars, holiday packages and more!